All clothes are second hand, and the blouse in pink is something vintage that I found in Stockholm. I love it and feel pretty in these clothes. Now the rest of this post will be about all the great mail I got this week! Every day I’ve got something amazing in the mailbox. 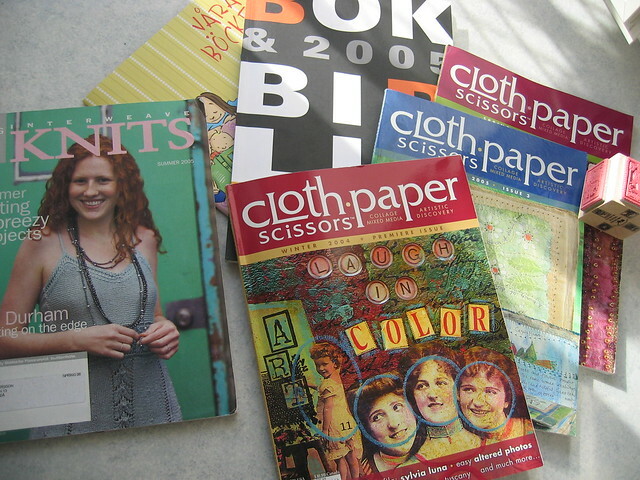 One free trial number of Interweave Knits (nice, but nothing I want to knit on spot) and three back issues of the new magazine Cloth paper scissors! I’ve read some here and some there, and I love it! Got it in only a week after ordering, and can’t wait until autumn when the forth number is out. I want to make everything in this cool magazine and try all new methods – this magazine sparks with inspiration and creativity! Go get it if you like Mixed Media! On the pic you can also see a cube stamp I got with four different motives from Stampers Anonymous! Fun stamp. Click picture for lager view of these goodies. 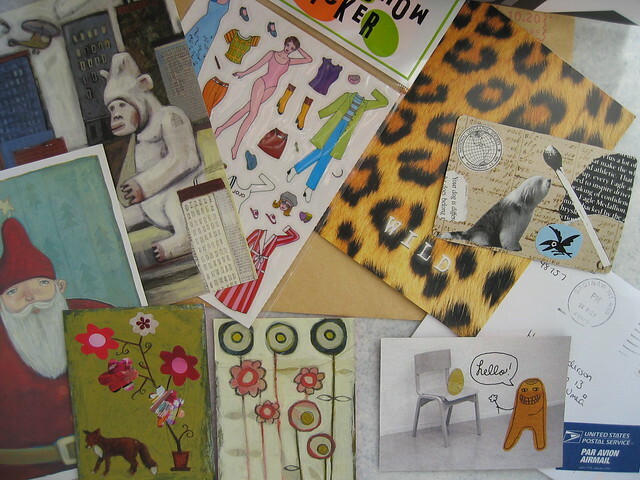 ATC-mail from artist Camilla Engman (with cool printed card from Camilla’s paintings) and Abby! Thank you girls! Three cool ATC with metallic stuff on from Mika (sooo cool!) and one ATC with Little Dot from Angelica of Scrapatorium! Thank you so much girls! 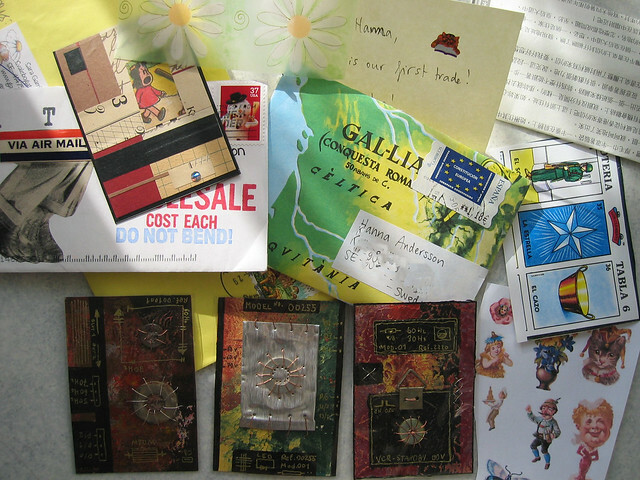 This entry was posted in Mail bliss and tagged ATC, magazine, mail art, swapping. Bookmark the permalink. now it looks much better :) no, it looks really good!! feels so good to wear skirts again. Hi again, Hanna. I have a question, where do you find people to swap ATCs with? Did you join an egroup for that? I’d love to know, I’m joining as many groups as I can so I can find new artists. Thanks for your help!